Home Icon Created with Sketch. 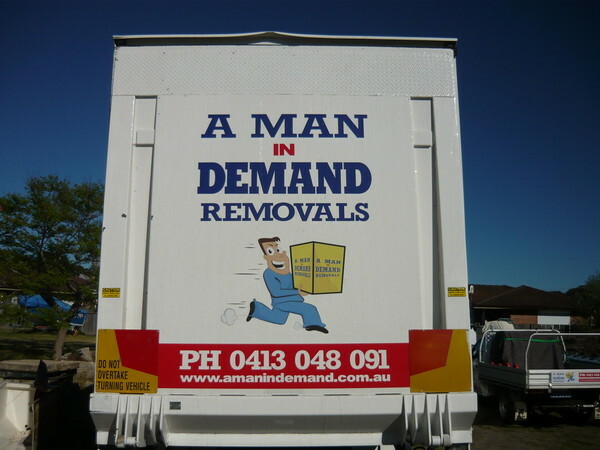 Put yourselves in the safe and capable hands of A Man In Demand removal's team who make moving house seem effortless. Your locally based Sydney Metro team has eight vehicles to choose from for small through to large jobs and pride themselves on their prompt, professional and efficient service. Removal services start from the reasonable rate of only $85 per hour. And the secret of his success? Pride is taken in every job to ensure it is done properly. The work is done efficiently and safely. Customer service and good communication is number one. Good organisation and preparation with proper equipment for each job. Job Description: Easy access both ends. Don hired A Man In Demand Removals for their Removalist job. Melissa hired A Man In Demand Removals for their Removalist job. Job Description: Moving 10 heavy items from the second level of a town house, and moving into new property- which is about 2kms away. Max 4hours. Joel hired A Man In Demand Removals for their Removalist job. Tamara hired A Man In Demand Removals for their Removalist job. Liz hired A Man In Demand Removals for their Removalist job. Sally hired A Man In Demand Removals for their Removalist job. Mac hired A Man In Demand Removals for their Removalist job. Cheap but a number of delays, tried to keep us informed but issues all the way. Be aware time is from Depot to depot!! Stuart hired A Man In Demand Removals for their Removalist job. Julie hired A Man In Demand Removals for their Removalist job. Job Description: Updated 12 Mar 2018 at 05:46pm: We are moving from a 4 bedroom house but we are only using 2 bedrooms. Also the property we are moving into is 2 stories. Ranelle hired A Man In Demand Removals for their Removalist job. Not what I thought. I know next time to ask more questions. On the phone they didn’t tell me when I booked that the time starts from base to base. That’s one hour used before they do anything. Woy Woy to west Gosford and back they allow half hour each way. Job Description: Current house single level, house we are moving to will involve going up 10 steps then a turn and 5 more steps. House is elevated but all living and bedrooms are in same level. Box count is estimate only. Gerald hired A Man In Demand Removals for their Removalist job. Jessica hired A Man In Demand Removals for their Removalist job. they were caring, efficient and knew their job!!! Daniel hired A Man In Demand Removals for their Removalist job. Job Description: Hi required any time between 14th and 21st of feb. We will move what we can so just need the big stuff done, but if there is room in the truck and not to expensive we will put some boxes in. Happy to discuss further as required. Maddy hired A Man In Demand Removals for their Removalist job. The guys were punctual and polite. Moved out of a townhouse into an apartment, needed to use a lift at the new place which nearly doubled the original quote. Good care was taken with furniture. More expensive than anticipated but overall satisfied with the job. Michael hired A Man In Demand Removals for their Removalist job. Job Description: I'm not sure how many boxes there would be as I haven't finished packing yet. At leasr half of my stuff is already packed into those plastic storage tubs. The only large items I have is my bed, mattress & ensemble base, a dresser and shelving units. I am moving from a house with flat driveway where the truck can come right up to the house into a apartment that is on the 3rd floor, only stairs, no lift. Job Description: Piano to be moved, 4 steps at drop off, no steps at pick-up. Your removalist team could only be described as excellent. Their friendliness and dedication to getting everything correct for us during the move was highly commended. Kim hired A Man In Demand Removals for their Removalist job. Job Description: Loading and unloading - truck can park at front door, 3 steps into each house. Chris hired A Man In Demand Removals for their Removalist job. Nice guys BUT Very very very slow! Guaranteed to run over 3 hrs no matter how prepared client is. Won't use again. Job Description: I need someone for Friday 25th in the morning. Removalists were a bit rough with the boxes. Only small truck arrived so 2 trips had to be made which increased time and money. Got charged 30 mins for them to do their paperwork! Amanda hired A Man In Demand Removals for their Removalist job. Paul hired A Man In Demand Removals for their Removalist job. Job Description: basically a truck load of furniture move about 2.5 hrs travelling time. job well done ....highly recommend ..careful with all our items and very helpful. Margaret hired A Man In Demand Removals for their Removalist job. Job Description: Mostly boxes and some large furniture, not much. Updated 11 Apr 2017 at 10:19am: Not a lot of furniture but LOTS of boxes. No bedroom, lounge room or dining furniture. A side by side 2 door fridge upstairs, a light display cabinet UPSTAIRS. Washing machine, dryer, small wardrobe, storage cupboards & filing cabinets, some chairs, quite a few book cases, a buffet, work bench & small machinery DOWNSTAIRS. The boys arrived on time and were very professional. I would recommend this service to anyone. Philip hired A Man In Demand Removals for their Removalist job. Luke hired A Man In Demand Removals for their Removalist job. Updated 19 Sep 2016 at 12:02pm: The beds include mattresses. Job Description: We need to move our things from a level 2 unit in Roselands 2196 to a storage facility in Woy Woy 2256 on Jan 20th 2016. We also need to hire the storage facility for that date. They were good value for money. Prompt and professional removalist service. Good communication throughout. I'm using their storage facilities as well and the prices are very reasonable. Highly recommended. I would most definitely use A Man in Demand removals again. John was very professional, knowledgeable, prompt and took the worry out of our move from Sydney to The Central Coast. Thanks John!! !